ARDEX X 17 is a white polymer fortified cement-based wall and floor tile adhesive that has been specially formulated with mastic type properties. ARDEX X 17 has an extended open time, is non slump and flexible. 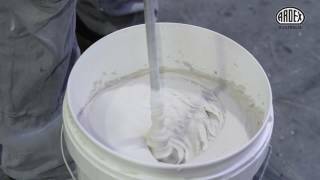 Mix with water to achieve a mortar suitable for internal and external use in residential and light commercial applications. ARDEX X 17 meets the Green Building Council of Australia Green Star IEQ-13 requirements for Ceramic Tile Adhesives.